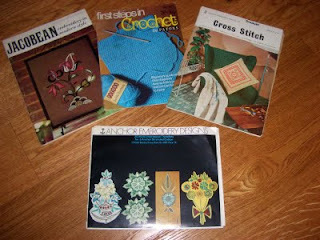 This weekend I raided my Mum's old knitting, sewing and crocheting patterns to see what gems I could unearth. There were some classic 1980's jumper patterns which I put back where I found them (after a good laugh), but I also discovered these fantastic embroidery patterns which are simply stunning. Not entirely sure what I will use them on but will be keeping them safe and close to hand for a rainy day.